Card design updated for legal reasons. After more than a year without new rookie cards, patient basketball collectors can finally rejoice. 2012-13 NBA Hoops Basketball comes with tons of rookies -- 72 of them to be exact. 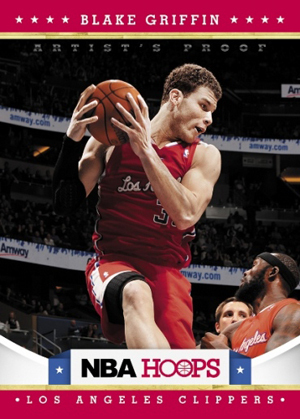 The entry level set combines both the 2011-12 and 2012-13 rookie classes as a part of the base set. The first set of the new basketball card collecting year, 2012-13 NBA Hoops Basketball has a 300-card base set. It's complimented with an Artist's Proof parallel. Despite being a low-end product, 2012-13 NBA Hoops Basketball still manages to squeeze two autographs into every hobby box. Granted, collectors shouldn't expect signatures from Kobe Bryant and Blake Griffin in every other box. But many smaller stars don't have a chance to shine on tons of autograph cards. That could add a little extra value to some of these cards. 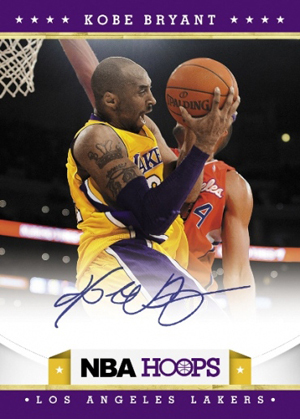 Besides regular autographs that parallel the base set, 2012-13 NBA Hoops has Draft Night Signatures. Similar to 2011-12 NBA Hoops, an NBA Championship short print is randomly inserted. 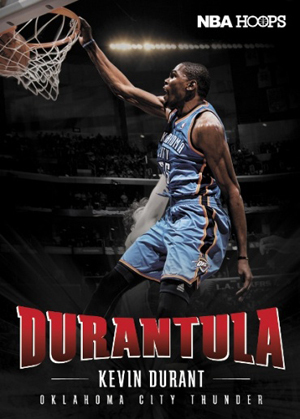 Building off of the Kobe Bryant 'Black Mamba' and Blake Griffin 'Blake Superior' cards is an equally tough card highlighting "Duarntula," Kevin Durant, another member of the Panini stable. 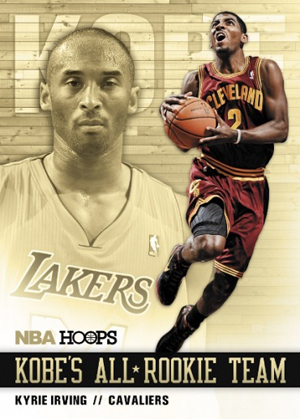 2012-13 NBA Hoops has several other nods to the past include Kobe's All-Rookie Team, which play off the Magic's All-Rookie Team cards that were popular in the mid 90s. 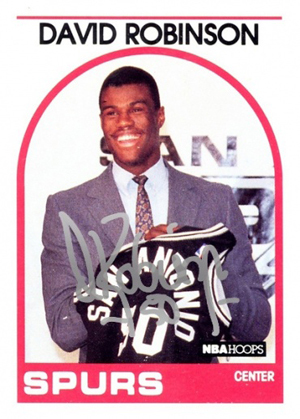 The set will also have Autographed 1989-90 Hoops Buybacks. 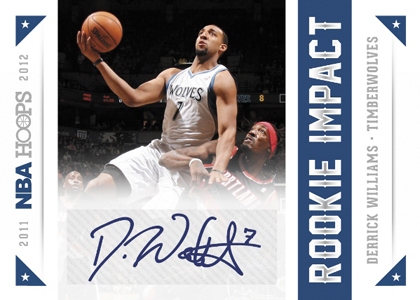 Other inserts in 2012-13 NBA Hoops include Spark Plugs and Rookie Impact. RCs are great especially from 2012. The XRCs from 2011 is difficult to tell, perhaps if they put Rookie it would have been better. The inserts are just plain and bland. Should have something else to differentiate from the base. Looks like just ordinary. Overall, product ok for starters to extreme collectors. These are my first basketball cards since the mid-90’s and my first foray back into sports card collecting. So for that alone, this set of NBA Hoops will have a special place in my heart. Too bad the cards themselves are bland and the inserts aren’t really that interesting. I was also annoyed to get a pack of all Kobe cards in my hobby box for “anti-Kobe” reasons haha. But as far as hobby boxes go, mine netted me all but 60 of the base cards so I consider it a success. But I will say this: it has definitely worked as my gateway drug back into sports cards, much to chagrin of my now-suffering girlfriend. Decent, not good or great, design this year. Though I could do without the stars and with a smaller Hoos logo. The RC checklist makes it worthwhile, though. Wish that Panini would start going exclusively to on-card autos. Can it really be that much more costly or time-consuming? The insert sets could go and I wouldn’t miss them. Overall, Hoops is nice for a Panini product, and given how mediocre it is that is not good news for Panini. Just like Score in Football this low end is full of surprises. I love the Buy Back Autos and Kobe Bryant All Rookie Inserts as well as the fact that its loaded with autos at a low price point. Im not into basketball currently, but may just buy a box or 2 and see what i get. One of the best parts of this year’s Hoops is the vivid imagery in all of the cards. Low angles, high angles and coaches! This set has it all. Boxes range from $50-$60 MSRP, and will get you two hits. Mine came with two autos from Quincy Miller and Markiff Morris. Both were sticker autos. This is a low end product, but there is plenty to enjoy here. So if you like opening lots of packs at a low cost, then this is the product for you. Like the “reasonable” price point that packs a punch. Quite the collection of rookie cards! Layouts and images are crisp and look great. I have about as much nostalgia for NBA Hoops as I do for NFL Pro Set both were the cheapest dullest cards on the market. But it was first to market with a good rookie class, so if you have empty shoeboxes in the back of your closet might as well see what fun you can have with this one. The “Score” of basketball. A cheap box price+2 autos in hobby+retail version not to shabby=a big winner for this collector. This is a product for all to enjoy. Well designed and some great autographs to chase..you can’t go wrong! One of the better Hoops sets. Inserts are good autos are what you would expect. Card stock same as previous years. For the price you get a good deal for 2 hits. I like these cards because they ar in my price range, and I have been collecting Hoops for years.. I dont like them because well I cant think of a reason. I dunno, what should I say? Should I be expecting more for the amount I’m paying? Today I bought my first set of 2012-13 NBA Hoops to test my luck. I pulled a handful of inserts, so should I be happy? Well I was, that was until I found out the inserts I pulled had pretty much the same value to the plain base card, value wise. Spark Plugs? BIGS? Spirit of the game? It was abit upsetting, from thinking I scored good hits, to finding out those hits were worth peanuts & were fairly pretty common to pull.